In the future use Tesco Finder app to "scan as you shop"
Tesco Finder, our R&D app currently available for iPhone, is ideal for trying out new ideas that come in from customers and staff. Not all ideas will be implemented but we like to try them out in a research context to test the art of the possible. Here's one example: use Tesco Finder to scan items as you proceed to shop in a Tesco store then have the app transfer the scanned items to a self-scan checkout so you don't have to re-scan them. To make it work, the self-scan checkout has a special barcode which Tesco Finder uses to identify it. When the customer arrives at the checkout, they scan the identifying barcode and then put the items into bags as normal. While they are bagging the products, the app connects to a wifi network and sends the scanned products contained in a file (named with the self-scan checkout's identifier) to a staging server. All the checkouts monitor the server continuously waiting for a file 'with their name on it' whereupon it is downloaded and ingested into the checkout software in an instant. The scanned products are displayed on the screen as if the customer had scanned them in to the checkout manually. All the customer has to do then is pay and go. Nice and quick - and fits snugly with Tesco Finder's philosophy of helping the customer get quickly to the products. Now please remember that this is a proof of concept and not going into Tesco Finder's production version any time soon. R&D is here to prove that the technology can deliver an improvement in the customer service without major system rewriting - and so our job here is completed successfully. This special proof-of-concept addition to the features of Tesco Finder was developed by Ben Martin who has recently joined Tesco.com R&D from his 'old' Tesco PLC equivalent team - and then proceeded to work with both Dotcom and 'PLC together to help the deliver the project. Ben is also well known for delivering the Tesco Clubcard app for iPhone, so Tesco Finder is in capable hands. It's mid-afternoon on a Saturday, and my copy of Tweetdeck is on the screen displaying my favourite filtered Twitter feeds. As you can imagine I have a column filtering "tesco iphone app" and I have to admit I'm enjoying the very many positive comments coming from 'the real world'. The team at Ribot are enjoying it too. Given that they designed and built the Tesco Groceries for iPhone app, their enjoyment at watching this very real feedback is even greater than mine (click here and you'll see what I mean). Ribot haven't finished with us yet, though. Their mobile expertise is affecting our thinking and what it means to actually make the customer's experience better by simplifying it. It's a similar story for Tesco Finder - now customers can get directly to the set of products they are looking for and ignore the cacophony of presentation surrounding them. Indeed I'm beginning to identify a new demographic of customer who has avoided big Tesco stores (particularly unfamiliar ones) in the past because they think it would take too long to find what they are looking for, so don't even attempt to visit. Teso Finder simplifies the journey to the product by enabling the customer to only look out for the navigation landmarks to get there (such as aisle number signs) and avoid the rest of the information hubbub. This new demographic of customer is now entering our doors - and together customers are using the app to find products at their chosen store at the rate of up to 5 requests a second according to Tesco Finder's server logs. Now a confirmation message has come down from the very top of Tesco that we must start work soon to join Tesco Groceries and Tesco Finder together into a single app. This means that in our work pipeline is your simple guide to Tesco groceries on your smart phone whether in-store, at-home or out-and-about - because, as Ribot have taught us: simpler mean better. A techfortesco reader has just alerted me to a very interesting article from a geography teacher's blog that is introducing Tesco Finder for iPhone/iPod Touch into geography lessons as part of an earthquake survival kit. Chris Green, Head of Geography at a west midlands secondary school, has created the lessons to teach his pupils how to plan and execute a disaster preparedness kit on a fixed budget. Pupils are given a budget of £250 and asked to create an earthquake survival kit suitable for their family based at their current address (we need to be prepared in the West Midlands!! - read this article from Wired). Following the teacher introduction using the resources above, pupils use their knowledge of short and long term effects and generate a 'real' shopping list on their ipods using the apps below. The Tesco Finder app allows pupils to search for products in their nearest store, make decisions about the price, add to a shopping basket (named by them) and generate a sub total. They can use the maps app to plan a route from their house to the store (extension task). It's great to see teachers using innovative ideas to teach kids, and here in Tesco.com R&D we're really chuffed that Mr. Green has chosen one of our apps to help him in his work. I don’t get any products, favourites or delivery slots when I use my iPhone or Nokia app - what’s wrong? If you get this problem, it means is that your grocery account is set to an ‘accessiblity’ profile. In order to make your account work with the app it needs to be displayed in ‘standard’ profile. Scroll down the screen and click on “Accessibility options”. Now you will see “Use access site” next to a checkbox with a tick in it – uncheck the box. Click the “Confirm” button and wait for the page that appears saying “Your changes have been successfully updated”. Finally click “Logout” at the bottom of the screen. Your account will now be displayed in ‘standard’ profile. Your account should now be compatible with your Tesco Groceries iPhone and Nokia apps. If you still have problems when you have performed these actions, please give our customer service centre a call on 0845 6756999. We are working to ensure that customers won’t have to do this in the future but for now, following the instructions above will make your account and app work together successfully. Whilst most customers are having no issues with the Tesco Groceries app, we can see from a few iTunes feedback reviews that a few are not getting all their products or delivery slots. Unfortunately there is no way of getting hold of the the authors of those reviews (or even responding to them) to find out what's up - and we just can't recreate the issue here at all which is hugely frustrating if customers are having problems. Nobody has contacted our customer service centre at all over this matter since last Wednesday's launch (and we're still in the top 5 for UK download counts according to iTunes) so we think it's affecting a very small number of people - we just need to find someone experiencing it so we can uncover what it is. It might just be a bad internet connection they experienced at the the time just before they wrote their review or something similar - but it's in the feedback comments and we just need to know. If you are having trouble getting delivery slots or products to appear, the Tesco iPhone Dev Team would like to hear from you. Please could you contact our support line on 0845 6756999 or email online@tesco.co.uk with the subject "iPhone app problem" and the message will be passed to us. We'll need your contact email address so we can get in touch with you, if that's OK.
those of you not filling my email and blog comments with barcode scanner questions, it's Android. Why haven't you included a barcode scanner? More like why haven't you included a Tesco Android app? I find it flabbergasting that so many leading UK businesses seem to ignore or lag behind in developing for the Android OS. 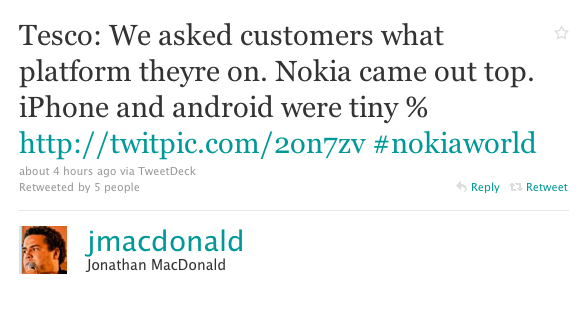 It's like they're oblivious to Android. 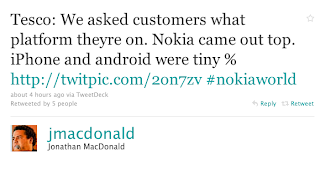 You'd be a very short-sighted company indeed to ignore the phenomenal growth in the Android userbase. It's well recognised that Android will eclipse iPhone next year for number of users. App usage will go through the roof as affordable smartphones hit the market. With Ocado sitting pretty with their app, Tesco really should be feeling a little nervous right now. Anyway, it's back to my Ocado app right now. Ta ta Tesco. We have heard you; we are on the case! The production mobile team we have put together is getting stuck in. On the other hand we're not going to rush something out. Whatever we do for Android will be gorgeous on Android and we won't release it until it is. It starts with me - I am ONLY using a Google Nexus One with Android 2.2 installed from now on. My beautiful beloved iPhone is now the possession of my very happy husband and I have vowed not to touch it beyond using it for testing updates to our iPhone apps (and placing grocery orders) until something from Tesco appears for Android. I'll stay true to my word - those of you coming to see me on business can ask me to show you my phone and prove to you when I last used it by showing the 'call log' screen (the phone is often glued to my ear). You want Tesco apps on Android! 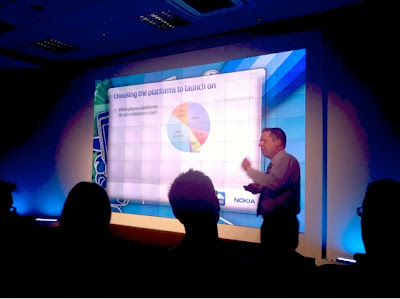 Tesco.com's Marketing Director Ian Crook was presenting at Nokia World today, talking about our Tesco Groceries for Nokia app. Why haven't we included the barcode scanner in Tesco Groceries? 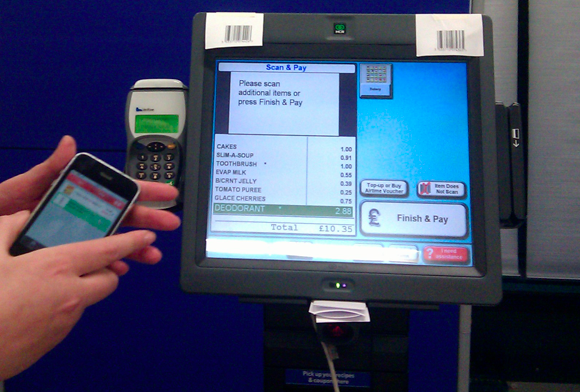 We have barcode scanning in Tesco Finder for iPhone, so why haven't we put the scanner into Tesco Groceries for iPhone? The reason is technical and to do with the new barcode scanning code that needs to be compatible with Apple's new iPhone operating system, iOS4 in a way that is satisfactory to Apple who are quite strict about the way that this must be performed. Indeed, until this is sorted we can't update Tesco Finder for iPhone as it would fail Apple's QA testing and get rejected (and we don't want that happening again). We were just keen to get Tesco Groceries for iPhone into your hands but there will be an update soon that will bring barcode scanning to your copy of the app. Indeed my colleague Becky is saying how much she is enjoying using it right now on our test iPhones (which is a big tick-in-the-box, believe me!). Yes, I've just volunteered to be one of thousands of "games makers" at the London 2012 Olympics. I hope my skills in information technology, radio communications (I'm a licensed radio amateur) and media / PR stuff will be of some use to the organisers. Mind you, I'll probably end up in the kitchen washing zillions of dishes or have to go with rubber gloves to unblock the lavatories. But hey, I'm so glad the Olympics are coming to London and I want to give something back for the 25 years I have enjoyed living in this amazing world city. Secretly I hope they need someone to support mobile apps, keep their computer systems going, and process all that data generated during the games. I can do that! I'm also glad that Tesco is involved - our company is part of the London Olympic legacy regeneration of the area around the Olympic park. For more on the London 2012 Olympics and becoming a games maker go to http://www.london2012.com because I may need help supporting that app ... or unblocking that loo....! Thanks to all of you who have downloaded our Tesco Groceries for iPhone application. The app is achieving a continuous top 10 position in iTunes for 'most downloaded free app' (it's at No. 5 right now) and is No.1 in the 'Lifestyle" category in the time period since it launched last Thursday. Of course downloads aren't everything - we'll be monitoring usage to see what customers use / avoid / love / hate about the application and tune it up appropriately. Downloaded it on 3G in sainsburys and went on to do shopping from tesco first time login no problem favourites loaded no problem 86 item order done and confirmed in 12 minutes well done Tesco. We've just launched our mobile applications portal web site. The site has essential information about all our applications and it will grow to become your complete guide to our mobile apps, with all kinds of support facilities too. Can multiple iPhone users add items to the same order? Technically, as long as the users are logged in to the same account, then yes you can add to the same order (or change quantities or remove the item). Indeed, this can be a mix of anyone on the iPhone app, the Nokia app, and the web site - each keeps the others up to date. I say 'technically' because if someone checks out an order, the basket is emptied ready for the next order and other users on the same account are not alerted to this unless they tap the 'basket' button which causes the app to ask our servers what the current basket status is. Always check the basket contents regularly before adding items if you know someone else is likely to be doing the same thing. Let's take a walkthrough of the Tesco Groceries app for iPhone, iPod Touch and iPad (the latter running in "iPhone mode"). If you're like me, then the first place to go when putting together an order is to use the Favourites list. When you registered your account and used a Clubcard, your Favourites list stores all the items you have previously purchased online and in-store. You can also filter your favourites to view just those on special offer. In the example below, notice that one of the products has a green background - this means that product is already in your basket. All searches showing products in your basket will be highlighted this way so you can change the quantity or even remove them if you wish. Finally here is the basket. From here you tap the checkout button which will cause the app to start the iPhone's Safari browser which will connect into a checkout special page designed for iPhone on the Tesco.com grocery web site. If you are called Paolo then your delicious chips and beer diet will soon be on its way. For everyone else, at least you'll get the entire grocery range to choose from - on average that's more than 20,000 products. Healthier products are available...! So there you are - our new little app for iPhone giving you personal, pocketable access to our complete grocery home shopping service. It's taken a year of planning, design, coding and testing by a fantastic team across Tesco.com and our mobile design and development partner Ribot. Tesco.com's grocery heart and soul in a little app. Tesco and Ribot present this powerful pocket of grocery home shopping to you now. We simply call it Tesco Groceries which says so much in so few words. Walkthrough follows in the next article. Computer Weekly, one of my favourite reads, has as exceeded even their own excellent forecasting abilities. In their article Tesco Finder app reaches 1m downloads published yesterday, they reinterpreted my blog entry of Friday which spoke of the number of Tesco Finder requests reaching one million, rather than app downloads reaching one million. Given that Tesco Groceries for iPhone is about to launch, I thought I'd compile the actual total count of downloads of all the other mobile apps we have out there on iPhone, Blackbery and Nokia stores. We have six currently which are (in order of launch) Tesco Finder for iPhone/iPod Touch, Tesco Wine Finder for iPhone, Tesco Clubcard for iPhone/iPod Touch, Blackberry Clubcard, Nokia Clubcard, and Nokia Groceries. Colleagues are used to my generally happy demeanour but even they weren't quite ready for the"OHHHH...YEESSSSS!!!!!" and waving of hands that came from somewhere within me. One million downloads. One million Tesco apps in the hands of our customers. And that's before Tesco Groceries for iPhone has launched. I always look forward to coming to work after a nice holiday break. Perhaps I'm strange but Tesco.com, like many other organisations in e-commerce, is a rather exciting place to work. Every week there's always some remarkable new statistic that has surfaced which makes for a interesting talking point around the water-coolers (yes, we really do that). It's even better being the author of such a statistic, especially when my holiday-mode brain is not quite ready for full scale work and normally makes me spend time doing no more than wading through the acres of email received during the vacation. Tesco Finder, our store and product finding application for iPhone has now reached its one millionth request! The anonymous customer who made the request was duly advised to head to aisle 23, unit 4 on the left hand side and the 3rd shelf up from the floor to find the searched for 'bovril'. Tesco Finder is coming up to its first birthday - a year of helping customers find our branches, and find the products in them!